Maruti Fertochem is manufacturing various grades of NPK Fertilisers as per the requirement of farmer and the crop. 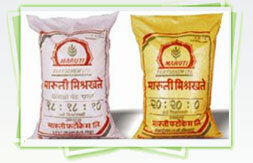 Maruti has varied grades formulated as per the need of crops. Maruti Fertochem is manufacturing various grades of Water Fertilisers as per the requirement of farmer and the crop. Maruti has varied grades formulated as per the need of crops. Organic N.P.K. Fertilizers of grades. Maruti Fertochem is manufacturing various grades of Organic N.P.K. Fertilisers as per the requirement of farmer and the crop. Maruti has varied grades formulated as per the need of crops. Maruti Fertochem a limited company was established in the year 1991 with active participation of 2500 farmers as shareholders of the company. The foundation stone of the first unit of Maruti at Latur District was laid by the auspicious hands of Hon’ble Shri. Vilasrao Deshmukh. Khadkeshwara Oil Mills Pvt. Ltd.